Modern Construction of Textiles. Lecture Three Notes. Construction of Knit. My own Textile Design Work. Rubbish Bags. My own Textile Design Work. What are the Bio-Materials within the Medical Feild? Developing from Medical Textiles to Body Suits – My beginning Thoughts, Questions and Aims. Human Microorganism Textiles Questions and Developmental Ideas. 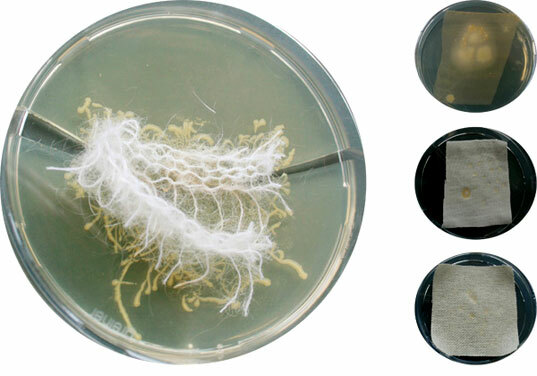 Human bacteria based textile – Bio-Material. The textile body suit has been known as a textile innovation to evolve and/or enhance human functions. I am briefly going to research some of the textile body suits that have done this. It is truly amazing how designer, scientists and entrepreneurs have come up with the idea to use textiles to evolve the properties of human actions and functions that otherwise aren’t normally possible. To watch a powerful Seminar from artist Jae Rhim Lee. Click the link below. She demonstrates that we can commit our bodies to a cleaner, greener Earth, even after death. Along with many other types of burials which causes further toxins into the atmosphere as described within Jae Rhim Lee’s Seminar. The burial suit contains infinity mushrooms which help decompose our bodies by feeding on dead skin cells as well as neutralizing and decomposing the toxins safely into the atmosphere and feeding it back into the environment. These mushrooms are “trained” to recognize human cells and be able to feed off the dead cells and decompose of them properly. The best of these mushrooms are picked and used for the burial suit. I think that this is a truly inspirational and amazing idea as it helps with the idea of a cleaner world and helping against pollution that adds to global warming and the pollution of our atmosphere. Jae Rhim Lee, (2011), Infinity Burial Project [ONLINE]. Available at: http://infinityburialproject.com/[Accessed 01 January 15]. Fabdesigns. 2013. Light weight, flexible radiation space suit with compression & fire resistance,. [ONLINE] Available at: http://launch.skild.com/skild2/challenge-launch/viewEntryDetail.action?pid=47652. [Accessed 01 January 15]. This suit has the potential to be a breakthrough in protective spacewear as it provides radiation protection for astronaughts with high-degree of flexibility and additional fire-resistance. The dangerous levels of radiation that astronauts are exposed to beyond the Earth’s orbit remains a significant health risk. I think this health risk could become a challenge for deeper exploration of the Solar System. Therefore this “Armoured Compression” body suit could help the challenge. The suit is created out of highly technical fabrications using industrial flat knitting machinery typically used for making sweaters. FabDesigns, (2013), Armoured Compression [ONLINE]. Available at:http://launch.skild.com/skild2/challenge-launch/viewEntryDetail.action?pid=47652 [Accessed 01 January 15]. Louise Trainor. 2011. Innovation: Catalytic Clothing. [ONLINE] Available at:http://www.wgsn.com/blogs/homebuildlife/innovation-catalytic-clothing. [Accessed 01 January 15]. I feel this is a great idea to utilize fashion to play an active role in the sustainability of our environment. Adam Mufti, (2011), Catalytic Clothing [ONLINE]. Available at:http://www.wgsn.com/blogs/homebuildlife/innovation-catalytic-clothing [Accessed 01 January 15]. Abigail Doan . 2009. Gross or Glorious?. [ONLINE] Available at: http://www.ecouterre.com/gross-or-glorious-austrian-designer-creates-clothing-from-your-bodys-bacteria/. [Accessed 01 January 15]. Repelled by heat, the fibers build up in areas that require the most warmth and insulation. Sonja Baumel, (2011), Bacteria Textile [ONLINE]. Available at: http://www.sonjabaeumel.at/ [Accessed 01 January 15]. 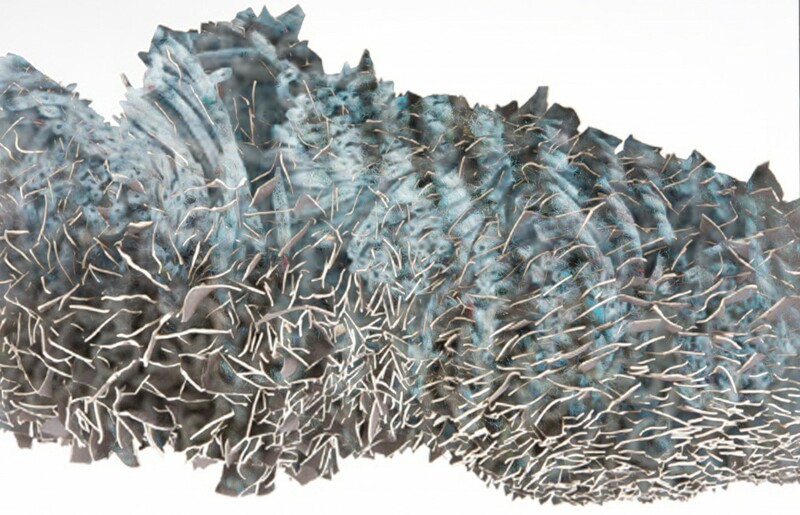 Sonja Baumel, (2011), Crochet Membrane [ONLINE]. Available at: http://www.sonjabaeumel.at/[Accessed 01 January 15]. This idea of creating a second layer of clothing out of our bacteria does not sound the most appealing however perhaps this could have a different function? perhaps human bacteria textiles could be turned into a medical textile that can be changed medicines? 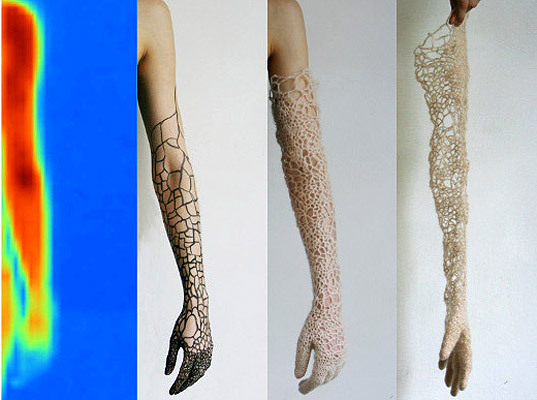 I really want to carry on this idea of the human bacteria textile in relation to medical textiles. I would like to research and analyse this further by looking into whether this is possible and its different functions and properties aswell as experimenting with its functionality and sustainability. This entry was posted in Body Suits. Bookmark the permalink.